One of the best things about living on the water is easily the wildlife, especially the ordinary but urban kind. To live in a city for a while – roaming free and ostensibly off-grid – in such close proximity to canal based creatures is fascinating. With the onset of spring, the wild ones seem more present than ever. 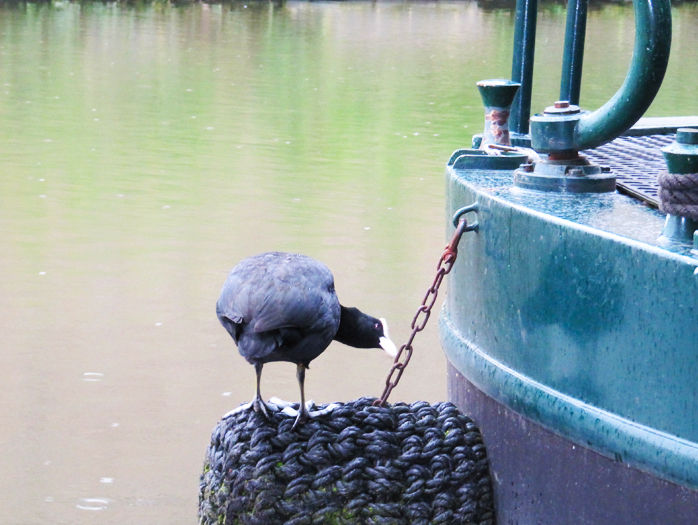 The canal is busy with coots, swans, mallards, moorhens, pigeons, seagulls, geese and ducklings. One night recently, near midnight, a lone bat darted overhead; today a grey heron has been hunting close by. On the boat itself, a huge brown moth is hiding out in the engine room; there are spiders with stripes in the bathroom and tiny ones hatching on deck. Along the towpath, healthy clumps of bright green nettles are growing dotted with glossy buttercups. A carpet of violas creeps and crawls over a certain, now bruised purple patch. Bright white and deep pink daisies sprout direct from brick walls. And the minute, barnacle-like bumps of chewing gum grey lichen leave discreet circular prints along the towpath’s concrete edge.